How To Use Grammarly for MS Word? 1 Why you need Grammarly for MS Word? 2 How to Install Grammarly on MS Word? Grammarly native application does not work in the MS Word that’s why you need to Grammarly add-on separately for the MS Word or MS Outlook. I believe that you are already aware of Grammarly and it’s featured. If you write your documents in the MS Word then it becomes quite difficult to copy the content from there and then check for the errors in Grammarly application. To get rid of this and to make your writing task easier there is an Add-on available of the Grammarly for the Microsoft Word and Outlook. For doing this you have to download the Add-on and then install that in your Microsoft Word. Once you install the Add-on then you will be able to check for the Grammatical errors directly in the MS Word application and you wouldn’t have to copy and paste the content externally. Another good is the thing if you are having a Grammarly Premium account then you can enjoy your Premium account features in the MS Word also. If you are not a Grammarly Premium member and looking for a good deal to buy Grammarly premium then you can avail some Grammarly Coupon and buy the premium subscription at the discount price. Why you need Grammarly for MS Word? If you are wondering that when there is Grammarly native application available for the Desktop then why should I use the Grammarly Add-on in the MS Word separately? So let me tell you that Grammarly native application will not support the MS Word and you have to copy paste the document in Application externally which is time-consuming. That’s why Grammarly has released Add-on for the MS Word which helps you in various ways in writing. The best thing you get about this add-on is that it will save your valuable time by letting you check for the errors in MS Word itself. How to Install Grammarly on MS Word? For using the Grammarly on MS Word you have to download the Grammarly Add-on for the MS Word. You can download the Grammarly Add-on from the official website or by visiting here. Now download the latest version of Microsoft Office which supports your system requirements. Now close all the Microsoft word documents or tabs. After that open the MS Word on your PC and click on the File or Microsoft button then Word Options > Add-ins > Under Manage select COM Add-ins > Go > Check Grammarly > Click OK.
That’s it, Now Grammarly tab will appear in your MS Word document. Sign In to your existing account if you have any or Sign Up for a new account of Grammarly to enjoy all the features. If you write in Microsoft Word or Outlook then you should install the Grammarly Add-on for sure and for other applications Grammarly Native Application works very well. Grammarly is available for all the platforms officially if you are writing the document in your browser then you can install the Extension of Grammarly on your browser. 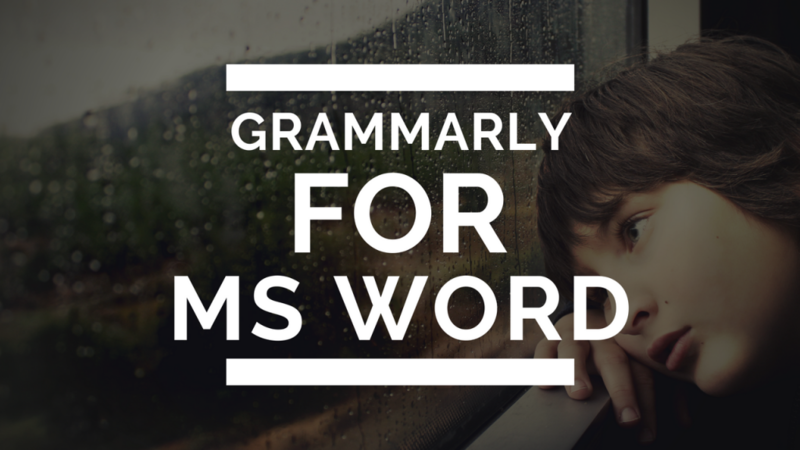 I hope you loved this article and got to know about Grammarly Add-on for MS Word and Outlook. If you are having trouble in installing Grammarly Add-on or if it is not working on your system then you can leave your query in the comments box below and we will get back to you within few hours. Share this article with your friends to let them know about the Grammarly Add-on for Microsoft Word.